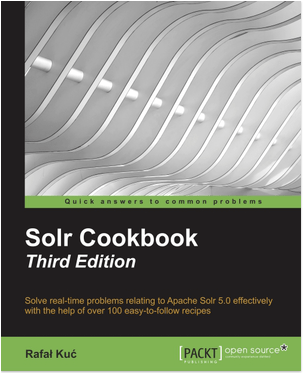 Hot off the press: a brand new Solr Cookbook! One of Sematext’s Solr and Elasticsearch experts — and authors — Rafał Kuć, has just published the third and latest edition of Solr Cookbook. This edition covers both Solr 4.x (based on the newest 4.10.3 version of Solr) and the just-released Solr 5.0. Similar to previous Solr Cookbooks, Rafal updated the book significantly — half of the previous content has been changed — and rewrote all of the recipes. Rafal isn’t the only Solr expert at Sematext; we’ve got several more who have helped 100+ clients to architect, scale, tune, and successfully deploy their Solr-based products. We also offer 24/7 production support for Solr and Elasticsearch. Here’s more info about our professional services, which also include Elasticsearch and Logging consulting. You can also monitor Solr performance (and many other platforms) with SPM Performance Monitoring. Have some feedback or questions for Rafal? Kafka Poll: Version You Use? any updates about the discount code? Samer, it should be working now. Do you still get an error? Sorry about the coupon issue – we will let you know as soon as we get any information. Warning:The discount for code “scte20” has reached its max number of uses. Thanks for letting us know. We’ve pinged Packt, the publisher, and will update the post when we get the new code (or try again later — Packt may choose to keep the code and just increase coupon usage limit).